Great art from others that you should check out! Hi! I'm Mr. Clay! I like to draw and make SFM pictures & animations. I like many games and movies including FNAF, Destiny, Bendy and the Ink Machine, Spyro, Rio, Star Wars, and other stuff as well. I also play hockey so I may make something including it once and a while. I also like trains (not the adsf joke I'm serious), cars, planes; basicly all vehicles. Anyways be sure to check out my art and have a noice day! Hey guys, I need to talk about some stuff I won't feel too comfortable saying, but I feel like it's important that I inform you of what's going on and why I've been so inactive the past 6 months. The truth is; I've made a mistake. Multiple mistakes. Mistakes that I wasn't even aware of doing, and now are coming back to haunt me. I don't know why I did them, and I don't know how or when I can manage to fix them. However, I think it's best that I start now because if I don't, the consequences will only get worse. Let’s just start that I should have never got into the mindset I've been in the past year in a half. I'm not sure if it's just the age I'm at, the things I'm being exposed to, or maybe the tasks I've been receiving from my school and my hockey, but even if it's because of all three of those things, I still made a mistake. I should of never let my lack of motivation and my large amount of laziness take over my work ethic. Deep down, I've always been wanting to make something; to go through with something, make a promise and just do what I said. These two traits I've deiced leak my personality have caused me to collapse doing all those things. I've been a terrible person. It may not seem like it and you can comment saying that's not true, but it honestly is. I've broken countless promises, mainly with those I've been collabing with, saying stuff like: "Oh yeah, it's ok, my part's almost done, so no big deal, it'll probably be out tomorrow haha.” Well, maybe not like that, but you know. But in reality, I was lying. Most the time when I said stuff like this I hadn't even started a collab part, and eventually even when I'd manage to start it I'd work very slow. Yet still, make these unrealistic promises. This has not only qualified with my online animation work, but my school work too, and even my hockey training and other simple tasks. I had a small feeling that I could always manage to go through with what I said. I don't know why I did since it's just flat out stupid to think I can get a 30-second collab part done in 2 nights when it generally takes me a month to get a 1-minute animation done, but for whatever reason I did. This feeling always stuck with me, no matter how ridiculous the deadline I made was. Reality is, no, I never managed to actually go through with what I said because of this feeling urging me on. Well, unless it was slightly unrealistic but still realistic enough to just barely work. Either way, if I did manage to go through with what I said, the product of what I promised wouldn't be as good or well done as I would usually do since the deadline caused my work ethic to get messed up completely. Sure, I can work fast, but the results may lack, and there's a good chance it'll be noticeable too. These mistakes of lying and making false deadlines may seem small or even meaningless to you guys, I know most of you would just shrug it off if I were not to go through with what I said because you guys have the patience and respect to accept my decisions, and I greatly appreciate that. This feeling, along with my laziness, has plagued me for far too long, and I need to let it go and go back to my normal work ethic and mindset. My content has definitely lacked and I haven't done a good enough job thanking you guys for the support you give me. I would be nothing without you guys. Even if people may say: "But Mr. Clay, you are underrated!” I don't think so. To be honest, it doesn't matter the number of followers I have on my social media accounts, it only matters that those who are following me enjoy the content I make. I don't get paid, and I don't plan to either. Now, I'm not trying to say: "Those who do commissions and monetize their videos are not true to their fan.” No, I'm not saying that at all. It's completely ok to do those things because your motives are most likely different as an animator. Being an animator is supposed to be a job, therefore, you should be getting paid for it if you're helping someone else earn money. That's completely understandable by me. SFM animators that make FNAF animations are indeed helping others earn money, we're promoting a game by the creator of the game, Scott Cawthon, and perhaps one who sees one of our videos will end up getting interested in the franchise and buy the game for themselves, and in some indirect way. We are probably helping Google or YouTube earn money as well, maybe even Valve, who knows? But yeah, I'm not trying to imply getting paid for SFM/FNAF animations is a "bad" thing. It isn't. My motives are just different, mainly since I'm still a "kid" and I don't have to worry about an actual job yet. There's also the factor of having to earn money so you can actually provide for yourself so you don't have to get a different job you don't enjoy as much. I usually don't get mad when a video doesn't get a major amount of views as I expected it to. Every once and a while I might since I may put a lot of time and effort in a video and it didn't do too successful, but that's not a bad thing. I shouldn't get upset if I video I made doesn't get a large amount of recognition despite the work I put into it. I should observe the reactions of those who do see it so I can know what to improve on and make sure I'm achieving my goal as an animator, providing content to a supportive community that actually enjoys it. If I make content that a majority of those watching despise, I'm not putting enough effort into what I make, or maybe two. I'm not in the right place. If someone who makes "quality" content for a community still gets despised, then maybe they should move to a different community that would enjoy their efforts more. This isn't always true of course, many animators in this community make outstanding work that goes unnoticed by many and it only leaves them to feel hopeless when they indeed put the time and effort those who do get large amounts of views do. But hey, that's just the YouTube algorithm I guess. Unfortunately, if you are a smaller channel you won't get noticed right away, well, perhaps never. But here is my advice; never give up. Keep making content, because I guarantee that eventually you'll get noticed and receive the recognition you deserve. 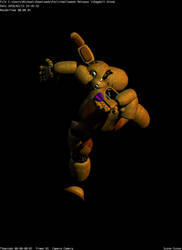 But I know for sure that I'm in the right place, those who have seen my work and have taken their time and effort to acknowledge me and my content have shown that, whether it be just regular viewers who are interested in SFM or animations in general, FNAF fans, other animators in the community, or even friends and family. I know I belong, and from the bottom of my heart, I thank all of you who have shown your support to me throughout the past 3 years I've been in this community. You've all done your part, now I need to do mine. I've been unfair to you guys to make a promise hyping up something and not going through with it, it only wastes your time and satisfaction. I need to make a change. I need to show that I care about you guys by doing what I'm supposed to do as an animator: make content my viewers enjoy. Thank you for everything, even starting today, I will make sure I go through with my promises and fix the damage I've made to my personality and get some actual content out to you guys. Obviously, I won't manage to go through with every promise I make for now on. I'm just human like everyone else, we all make mistakes no matter what. It's just a part of our sinful nature, but I can still try and hopefully succeed in repaying you guys for the support. I feel so sorry for how I've acted on how indirect and quiet I've been, I don't want anyone to go into the comments saying: "Hey man, it's ok you did nothing wrong.” I don't deserve the companion, I need to make things right instead of trying to rub it off by making you guys feel sorry for me. Hopefully, this mess of a journal I wrote doesn't seem too cliched or unnaturally wholesome, I just want to make myself a better person, and I feel like getting a bit real and personal with you guys is a good way to start. I plan to get 100 deviations uploaded before the year ends and get over 30 uploads out on Youtube, that may seem like a lot, but I can do it, I need to use go back and reread your guys' comments and use that as a motivator, and I should be able to do accomplish that goal. Thank you for reading and have a great day, expect more stuff coming soon, starting tomorrow. 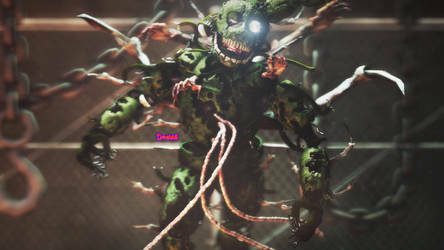 Anyways, here's a poster I wanted to make since I've officially started my Spring Break and I felt like Springtrap would make a good first character to do a poster with (the whole "Spring" part of it is unintentional but hey that works too), but ye I also wanted to add some of the Phantoms in, some random props, the FNAF 3 extras menu background, and Springtrap's old bowtie because why not? I guess it kinda looks cool on him, idk, but ye all in all I'm very happy to be on vacation now and I'll probably make atleast 2 more posters today and few more tomorrow (I'm also working on collab parts that are about to be late so ye), but overall expect a lot of stuff from me the next week and a half and if you want to see how my vacation is going for the heck of it I'll probably post some stuff from time to time on Twitter as well, which you can find here: twitter.com/MClay1983 , so yeah, I hope you like this poster and stAy tuned for more stuff coming sOOn! Zoom in for the best quality! [SFM/FNAF: Help Wanted/Poster] Remember Jeremy. Oof sorry it took me so long to upload this on here, I stuck it on Twitter than forgot about it for a while so I might as well do it now lol. Spyro: The Reignited Trilogy and its characters belong to: Toys for Bob, Insomniac Games, Vicarious Visions, Activision, Activision Blizzard, Konami, etc. Sorry about that, anyways, here's my first poster for a nEw thing I've been into recently, the Spyro franchise, specifically the newest games in the Reignited Trilogy. I started to get interested in these games soon after they got released back in November once Youtubers like Jacksepticeye and Dawko started playing the first game in the trilogy on their channels. I really enjoyed watching them play through it because of the artistic direction Spyro has in its gameplay, animated cutscenes, and overall representation it gave to me while watching it, I really like balance of cartoony yet also realistic movements the games have and the landscapes in each level always have something new and interesting to show. Idk, I won't go into a full blown review of what I think about these games since that's not what this description is supposed to be about, but I just wanted to mention that I really like this franchise and I might make more stuff related to it in the future depending on the feedback I get on this poster. But ye, I apologize if the posing is a bit basic on Spyro, if it wouldn't of taken so long to render and edit I would of went back and made it look a bit more complex, but I'll try to improve it next time I make a render with him. All in all, I hope you guys enjoy this poster and hopefully it doesn't look too bland, there aren't too many models at the moment of characters/props from the Reignited Trilogy so my current ideas can't exactly be carried out until either more models are made or the games come to PC and someone ports the official models to SFM, but wE'll see, thanks for reading and stay tuned for more contEnt coming soon. Also also thanks to for helping me edit this by telling me about techniques to do stuff in Paint.net, it would of taken me much longer to edit this if she didn't tell me that stuff so go hecking watch her stuff since she makes quAlity content and is an epic friend. Okie, I finally managed to get a poster uploaded, and it's my first one in 2019, so that's pretty epic. Anyways, here's a new poster at last, I already made a journal talking about my absence the past few months so I won't type another paragraph here explaining why, but hopefully I can make up for my wasted time by uploading a few more posters and maybe even a drawing or two by the end of this month. But ye, here's a poster that mainly showcases the Original animatronic band (unwithered characters) with a bit of small edits to fit my interpretation of what I think they would of been like when they were in mid-condition. I managed to find some other models other than only Coolio's that I liked more, so that's why Bonnie and Chica are made by Damikel instead of Coolio, so hopefully these two pairs don't look out of place with each other much. (I also did a bunch of texture edits on all the models to make them look more similar as well) I also tried to do some small scene building in the background (I didn't use a map for this btw, the walls are just panels and the floor is a seperate model), including adding Little Joe sitting in the corner, because why not? He's a pretty underrated character in my opinion and I feel like he deserves more attention and looks good with the rest of the props in the background. (yeah I know Little Joe shouldn't be in the unwithered pizzeria and should be in the SL facility, but I just wanted to add him here for the heck of it lol) Another difference you may notice is that my watermark finally changed as well, I will now be using the one you see in the bottom right corner and I'll make sure to edit the colors of it each time I make a poster so it fits the general vibe each poster gives. (I'll also be adding the date the poster was made too for now on) All in all, I hope you all enjoy this poster and I plan and really hope to be much more active here for now on and on my other social media as well, I have a feeling this will be a great year and I'm very excited to see what's in store for the FNAF community and all other communities as well. Thanks for reading and stay tuned for more posters & drawings coming soon! Hey guys, I apologize for my long absence and lack of uploading here on Deviantart despite what I had said earlier on about me being more active and stuff. I've been making too many promises like these that I end up not going through with and I want to change my ways and be much more active this year starting today. I'll be uploading a poster in about an hour or so and I'll start doing traditional drawings on a regular basis too, I plan to draw some FNAF related things and draw some characters from other games too, especially characters from the Spyro Reignited Trilogy, since I got into those games soon after publishing my previous poster and I really want to draw some stuff related to it since I really enjoy playing those games and I think the characters and pretty neat and ePiC as well, so ye, stay tuned for some drawings related to that and pOssibly some SFM renders of Spyro himself since there's a pretty decent model of him on the workshop that I want to try out so ye. But yeah, again, I'm sorry I was dead yet again for so long, my motivation to animate and draw for the past few months has been pretty low and I've been very busy with school and hockey, but my motivation is coming back now, especially since I have half days in school tomorrow and Friday due to exams and stuff. Thanks for all the support on YouTube and here and for still being here despite my inactivity, hopefully I can make this my most successful year yet and I'll try to be the most active as well, stay tuned for the poster and have a great day. stAy epic. Okie I'll actually try to be more active on here now, I need to stop taking breaks from uploading posters and draw more often as well, so expect me to post more frequently on here for now on. [SFM/FNAF] ...Isn't She Supposed to be on Stage? O jeez, tomorrow's Sister Location's 2nd anniversary... wow. Part of me feels like these past 2 years have gone by pretty quick, while the other half feels as if it's been 3-4 years, but all in all these past two years have been one heck of a ride, all the new additions to the FNAF franchise and all the amazing things this community has done between now and then has been really enjoyable to see, and I can't wait to see what happens next. Anyways, here's a poster I wanted to make mainly because I wanted to make a Sister Location themed poster since it's SL's 2nd anniversary tomorrow, but also because I just miss making posters on a regular basis in the first place, The main premise of this poster mainly showcases the idea that we never seem to see Baby in the game itself until the 5th night, and while we check up on her room the first few nights, she's nowhere to be found, yet we can still hear her loud and clear. No, I don't actually believe that she literally stands behind the player, that would be kinda dumb if it were actually true lol, but I still wanted to portray the situation like this because even though we don't see her, we know that she's still there and is watching us. On a side note, I tried to make the lighting in this poster look interesting and wanted to make the FOV come from a position where we could clearly see Baby, while I make Michael look clueless to where she actually is, which is why I stuck it next to the camera on the right. All in all, I hope you guys like this poster, it's been a while since I've made a poster solely related to Sister Location, and I think this is the first time I've made a poster dedicated to only Baby and the Bidybabs, so ye. I'll be making a few more SL-related posters tomorrow during the anniversary, and I'm also going to try to get a collab part finished as well either tomorrow or on Monday. Thanks for viewing this poster and stAy tuned for more cOntent coming soon. Make sure to zoom in for better quality! OOF this is extremely late, sorry about that. Anyways, here's my entry for 's FNAF Thank You! collab. This took my way longer than I thought it would due to it being my first successful completed digital art drawing, so it took me a little while to get used to everything. I really hope my lateness won't effect the release date for this collab, I was supposed to have this done 4 days ago but due to my poor planning it took me a bit longer. But ye, I'm not too happy with how this came out due to the lines getting messed up by the shading and the somewhat sloppy look to this, but I still hope it looks ok. All in all, I hope you guys like this drawing and I'll be getting back to work on SFM stuff now. hey man do you have a discord? Its nice to see some really colorful posters from you, they are my favorite .w. Ayy thank you very much! I had a great time on my birthday, it definitely one of the best ones yet for sure, thanks again, I really appreciate it! Ayy thank you very much!